USGS Klamath Lake water quality and sucker distribution updates. Bureau of Reclamation Hydrology database of the Klamath Project. Solution save Klamath Dams: To the attention of Mr. Craig Tucker, fellow (anti-dam)campaigners and Klamath Water Users, from Sean McKinney, Australia, 7/4/07. Klamath lake system and water quality, by Werner F. Hoyt, P.E., Lake Shastina, California, October 8, 2018. Comments to the Klamath Facilities Removal, Public Draft, EIS/EIR by Werner F Hoyt, Mechanical/Marine Engineer, pdf 12/30/11. HERE for Word Document. . "...The basic premise of the removal is the requirement is to restore upper basin as salmon and steelhead habitat is a predetermination of the KRBA. Evidence not presented in the EIS/EIR is that there was not habitat above Keno due to the reef at Keno. In absence of the Keno Dam the natural reef would prevent any migration further into the Klamath basin. Coho were introduced in 1895 by DFG...."
Tule Lake Basin Advisory Group Membership for North Coast Regional Water Board Program for Discharges of Waste Associated with Agricultural Lands in the Tule Lake Basin. (quote from Klamath Riverkeeper's website in 2010: "Our successful lawsuits, nonstop policy advocacy, and targeted grassroots pressure forced PacifiCorp to sign a stakeholder agreement to un-dam and restore the Klamath River in 2010. EPA, Corps put two-year hold on 2015 WOTUS rule, Issue 2/7/18, California Farm Bureau Federation AgAlert. "The 2015 WOTUS rule developed by the Obama administration will not be applicable for the next two years, while we work through the process of providing long-term regulatory certainty across all 50 states about what waters are subject to federal regulation." US Food Security and Farmers’ Livelihoods at Stake in “Waters of the US” Rule Rewrite, WLF by Lawrence A. Kogan, 4/20/17. Rescheduled! Water Board scoping meeting: Jan. 26, 5-7pm Yreka, Ca. Compost project gets airing: pushback, some support, H&N 7/30/16. KBC NOTE: This article twists the facts a bit. It says "The DEQ has also evaluated the site for risks to ground water, surface water and odors, finding low to potential risks for the site." The DEQ webpage, http://www.oregon.gov/deq/pub/061016stateline.pdf, says, ""...Type 3 feedstocks include dead animals, meat and source-separated mixed food waste and industrially produced non-vegetative food waste. They also include other materials the department determines pose a low level of risk from hazardous substances and a higher level of risk from physical contaminants and human pathogens compared to type 1 and 2 feedstocks. Surface water risk screening - poses potential risk: ...the proximity of this site to irrigation drainage waters and the potential for this water to reach the property, or for any uncontaminated runoff from this property to reach drainage waters elevates the potential risk level for surface water. ...Odor risk screening- poses potential risk...". KBC NOTE continued: There were nearly 40 attendees and less than a handful supported the site at this location. *Past info regarding compost site on Lower Klamath: Proposed Solid Waste Permit for Stateline Compost. * “It is anticipated that up to 30,000 tons per year of feedstock will be processed at the facility. This total includes the combined volume of type 1, 2 and 3 feedstocks. * Odor risk screening (poses potential risk)"
Facility would be 1/4 mile from California border by highway 97. * Calif. State water Board comment period Dec. 21, 2014 of proposed amendment to water quality control policy for Clean Water Act. * North Coast Regional Water Quality Control Board staff is looking for public comments for the Basin Plan by January 9, 2015 This plan will regulate and fee your water discharge. "Watch over the legitimacy, and the truthfulness, of what we call science," by Oregon Senator Doug Whitsett, posted to KBC 6/23/14. * "Upper Klamath Lake TMDL is based on the false assumption that development of the Upper Basin by European man has resulted in significant increases in the phosphorous concentration that helps to cause poor water quality in Upper Klamath Lake...."
2/12/14 - California Regional Water Board to demand permits from Tule Lake irrigators: "Agricultural Lands in the Tule Lake Watershed: The Regional Water Board is committed to working with stakeholders to address concerns, identify opportunities, and uphold state policies and requirements. Regional Water Board staff have been working with a Stakeholder Advisory Group made up of representatives of a variety of stakeholder interests. The purpose of the Advisory Group is to provide input to Regional Water Board staff on permit elements and alternatives prior to the formal public review period, which will precede consideration of the permits by the Regional Water Board. A list of current Advisory Group members, Regional Water Board staff contact information, and more detail on the Program are provided on the Agricultural Lands Discharge Program web page: http://www.waterboards.ca.gov/northcoast/water_issues/programs/agricultural_lands/"
*** EPA wants to control ALL waters, not just "navigable". Nov. 6 PUBLIC COMMENT DEADLINE EXTENDED TO NOVEMBER 13TH. EPA Corps Jurisdiction Comments. Get your comments in by Nov. 13th or sooner. Jackson County landowner sentenced for illegal ponds, gets 90 days for storing rain and snowmelt runoff, H&N, posted to KBC 5/4/13. October 23rd, 9-1 at KWUA, Klamath Water Users Association building, North Coast Regional Water Quality Control Board, Tulelake and Butte Valley meeting agenda. Also agenda for Scott, Shasta and Mid-Klamath on October 24th. North Coast Ag Lands Advisory Group: Ag Lands Conditional Waiver Overview Water Quality Management Plans Info "Regulatory actions...can include (among others): water quality performance standards, discharge prohibitions, planning requirements, monitoring and reporting requirements, fees, and other procedural details..."
North Coast Stakeholder Advisory Group Meeting Schedules Tulelake/Butte Valley Oct. 23 and tour, at KWUA, 9 a.m. Scott/Shasta Oct 24 Yreka. Integrated Water Resource Management (IWRM) – Part 1, Column by Siskiyou County Supervisor Marcia Armstrong 9/18/12. "IWRM was born out of The Dublin Statement on Water and Sustainable Development created at the International Conference on Water and the Environment held in Ireland in 1992. ..“Integrated Water Resources Management” was featured in Chapter 18 of Agenda 21.."
North Coast Stakeholder Advisory Group Meeting Schedules, posted to KBC 8/26/12. Sonoma_Oct 15, Humboldt Oct.18, Tulelake/Butte Valley Oct. 23 and tour, Scott/Shasta Oct 24 Yreka. Blue-green algae study on Klamath reservoirs frustrates tribes; PacifiCorps says treatment is safe, Times Standard 9/9/12. Supremes: EPA actions 'Outrageous.' Argument comes in dispute over agency threats to Idaho family Sacketts, WND 1/9/12. "..the penalties that the federal agency could apply to the family, if officials chose, would be $75,000 per day. That would be $37,500 per day for violating the Clean Water Act, even though that hasn’t been adjudicated, and another $37,500 daily for violating the mandatory “order.” Given the four years that have passed since the dispute erupted, the total penalties at this point would be in the range somewhere above $110 million." Water quality issues, Siskiyou Daily 1/9/12. "The North Coast region’s advisory group will be advised by four sub-regional advisory stakeholder groups. The groups are: • Tulelake area and Butte Valley; • Scott River watershed, Shasta River watershed and the Upper Mid-Klamath Region; • Del Norte County, Humboldt County and Trinity County; and • Sonoma County, Medocino County and Marin County." Oregon Set to Enact Strict, New Water Quality Standards to Satisfy EPA, Tribes, Marten Law 8/23/11. "The new standard for fish consumption is 10 times higher than the previous one, and assumes Oregonians will eat 23 eight-ounce meals of Oregon caught fish per month. That rate of consumption translates into dramatically lower permissible discharge levels for 106 pollutants...which in turn could dramatically increase treatment costs for municipal sewage treatment, agriculture, and many manufacturing industries, including paper mills at a time when those industries are already struggling." Scoping input on the Klamath Settlement EIS / EIR Process 7/19/10, by John Menke PhD and Jennifer Menke. Letter to Mr. Ben Zabinsky, Water Resources Control Engineer, from scientist John W. Menke, PhD. followed by letter from Mr. Zabinsky posted to KBC 7/18/11. "Are you also aware that that board lied to a landowner in the Redding/Anderson area when he refused to join a coalition which that board threatened him with up to a $1,000 per day fine if he did not sign up to join that coalition? And are you also aware that..."
Letter to Bryan McFadin, staff of North Coast Regional Water Quality Control Board, from Liz Bowen, President Scott Valley Protect Our Water. "...We checked with the Siskiyou County Public Health Dept and in the last 50 years, there has NEVER been a case reported by a doctor of someone getting sick from swimming in Scott, Shasta or Klamath Rivers....Insinuations are misleading and false. They also destroy trust...Under the Constitution, government is established to serve the people NOT destroy their lives and livelihoods. We stand resolute... We will NOT obtain a Permit to Farm under any kind of name." EPA Guidance Seeks to Clarify Reach of Clean Water Act, Somach, Simmons and Dunn Law, posted to KBC May 12, 2011. Representative Denham Responds To EPA “Guidance” To Expand Clean Water Act Jurisdiction, 4/27/11. HERE for entire letter from Congressmen to EPA and Army Corp of Engineers: "170 House Republicans and Democrats recently wrote to EPA and the Corps of Engineers to express their concerns that the agencies are circumventing the proper regulatory process in order to push through this expansion of federal jurisdiction." Oregon Senator Doug Whitsett: More job killing rules from ODEQ 3/11/11. "The Oregon Department of Environmental Quality is in the process of adopting the most restrictive water quality standards in the nation...These new rules have the potential to profoundly affect the fiscal soundness of businesses, agriculture and forestry in the state. They may be expected to have an extreme negative effect on Oregon’s future job growth and economic recovery...the scientific relevance of these studies is at best pathetic and at worst criminally negligent." Regulations. The existing deadline for comment is February 15." * Enviro's file another suit - this one effects the entire nation, not just the Northwest. Water regulations may affect irrigation, H&N 1/5/11, followed by EPA approves water quality plan for Klamath River by JEFF BARNARD. KBC links to KBRA "friends" (Including PCFFA Glen Spain and Klamath Riverkeeper/Craig Tucker) who sued State water boards to force unattainable mandates on Klamath irrigators. This is the same water board that is the lead agency with Klamath River Tribes strategizing how to increase flows and downsize agriculture. State issues final order on pollution limits, EPA has 30 days to approve or reject the order, H&N 12/22/10. HERE for Water Quality page. Related info: who is demanding our water quality requirements: Posted 11/4/10 - California State Water Resources Control Board demands impossible TMDL's/water quality demands of the Klamath Basin considering that the source of the water is naturally high in minerals. Klamath Water Users Association/KWUA wrote the board July 2009 explaining the "unachievable load allocations" demanded by the water board. These unattainable demands are the result of KWUA's friends on their KBRA agreement, PCFFA/Pacific Coast Federation of Fishermen, and tribes and other environmental groups, litigating to demand these regulations. Water Board Adopts Pollution Limits for the Klamath Basin, Indybay 9/8/10. "Representatives from the PCFFA, Karuk Tribe, Yurok Tribe, Klamath Riverkeeper, the Klamath Forest Alliance and the Sierra Club testified at the meeting in support of the TMDLs." (KBC NOTE: a KBRA author Craig Tucker, spokesman for the Karuk Tribe and former environmental activist, is a member of Klamath Forest Alliance and founder of Klamath Riverkeeper. Their KBRA, Klamath Basin Restoration Agreement, says, "The Parties commit, subject to Applicable Law, to support the development and implementation of appropriate TMDLs and other water quality improvement programs adopted by the states within the Klamath Basin." TMDL bureaucrats blindly enforce regulations, Pursue legal action; federal, state policies arbitrary, unreasonable, H&N guest writer Dennis Linthicum, posted to KBC 12/8/10. TMDL's public comment period coming soon. This Notice is being sent by the California Water Boards on behalf of the U.S. Environmental Protection Agency, 11/17/10. "On November 12, 2010, U.S.EPA approved California’s 2008-2010 Section 303(d) list of impaired waters requiring TMDLs, and disapproved the omission of several water bodies and associated pollutants that meet federal listing requirements. U.S.EPA identified additional water bodies and pollutants for inclusion on the State’s 303(d) list. U.S.EPA is providing the public an opportunity to review its decisions to add waters and pollutants to California’s 2008-2010 Section 303(d) List. U.S.EPA will consider public comments received..."
(Klamath) County officials want answers to proposed TMDL, H&N 10/7/10. Meeting tomorrow, Monday Nov 8. Scroll down to Nov. 4 post on TMDL's. More on Water Quality page. Posted 11/4/10 - California State Water Resources Control Board demands impossible TMDL's/water quality demands of the Klamath Basin considering that the source of the water is naturally high in minerals. Klamath Water Users Association/KWUA wrote the board July 2009 explaining the "unachievable load allocations" demanded by the water board. Their KBRA, Klamath Basin Restoration Agreement, says, "The Parties commit, subject to Applicable Law, to support the development and implementation of appropriate TMDLs and otherwater quality improvement programs adopted by the states within the Klamath Basin." Water Quality and Suction Dredging, Letter by Gerald Hobbs 8/28/10, President of Public Lands for the People. 111th CONGRESS 2d Session H. R. 5088 Clean Water Act, posted to KBC 6/4/10. Government would control, "all other waters, including intrastate lakes, rivers, streams (including intermittent streams), mudflats, sandflats, wetlands, sloughs, prairie potholes, wet meadows, playa lakes, or natural ponds..."
Letter to Steve Kirk, Oregon Dept. of Environmental Quality, by Tom Mallams, Off-Project irrigator, posted to KBC 3/27/10. "Since the development of the Klamath Reclamation project, and irrigation development in the upper basin, there is a recorded increase of 30% in flows downstream (study done by Mark Van Camp, a hydrologist). Without the project all the water from Lost River would never reach the Klamath River. Before the project, Lost River ended up in Tulelake and simply evaporated away there." Dam removal: Making the decision, H&N, posted 2/13/10. "However, the effect of Upper Klamath Lake in the equation is the “600-pound gorilla,” Anderson said. The hope is that restoration activity impacting the nutrient load into the lake will reduce the amount of nutrients exported down river. (KBC NOTE: National Academy of Science professor William Lewis, in 2004 workship, " When asked if it would work to control the significant part of the ph load, Lewis responded that the lake is 140 square miles...that is not feasible to change." Klamath TMDL, by Siskiyou County Supervisor Marcia Armstrong, posted to KBC 1/24/10. "The North Coast Water Quality Control Board will be receiving oral comments on the Klamath and Lost River Total Maximum Daily Loads (TMDL) on Wednesday, January 27 at 10 a.m...."
California Regional Water Quality Control Board agenda for Yreka, Santa Rosa, and Klamath, Calif., posted 1/10/10. HERE for more on workshop and TMDL comment period. These TMDL mandates are the result of a court action by Pacific Coast Federation of Fishermen, a "stakeholder" at the Klamath Basin Restoration Agreement negotiations. * Klamath River Temperature, Dissolved Oxygen, Nutrient, and Microcystin TMDLs, public comment period ends February 9, 2010. * Klamath River and Lost River TMDL Implementation Plan Workshop Jan 27, 2010 Yreka, 10 a.m.
EPA representative describes relationship to Klamath TMDL by David Smith, Siskiyou Daily News 9/25/09. "According to the Environmental Protection Information Center Web site, the consent decree was entered at the conclusion of a lawsuit filed against the EPA titled “Pacific Coast Federation of Fishermen’s Associations, et al. v. Marcus.” The site states that the suit was aimed at compelling the EPA to create the TMDLs for 17 north coast rivers and streams..."
*** Public Comment! until 8/27/09 Ca. Regional Water Board action mandates regarding Draft Klamath River Total Maximum Daily Loads. This this is a draft mandate to improve naturally warm and mineral-laden water. What do you think of a gigantic water plant to clean the naturally mineral-laden water coming from springs and Klamath Lake? How about 100's of MILLIONS of dollars to decommission roads, clean the water, pipe water, monitor all water, reroute water? It is very important that you read this lengthy volume of draft mandates for water in the Klamath watershed and send comments by 8/27/09! HERE for CA Regional Water Board draft mandates, money you will spend, what you must do to make your water pristine. Here for Tulelake KBC report 3/16/09 > Regional Water Quality Control Board wants Klamath Project's historically putrid water to become cold and clean. Lawsuit by Klamath Basin Restoration Agreement parties causes Water Board to target Klamath Project water users. Transcripts from the four public scoping meetings held in N. California in Oct. regarding dam removal and environmental concerns. They were held by the Calif. Water Quality Control Board. Full transcripts of the public comments are included, as well as introduction and explanation of the purpose of the meetings. Please send comments to the board by Feb. 23. Yreka Klamath Orleans Eureka Two groups at the Klamath settlement table, North Coast Environmental Center and Pacific Coast Federation of Fishermen, support taking out the Keno Dam as well. People at the Yreka meeting presented testimony objecting to dam removal. Most of those objecting are not allowed at the table. Eureka. Supervisors discuss comments to Klamath TMDL plan, Siskiyou Daily News, posted to KBC 8/30/09. "Not a single person present at the meeting spoke in favor of any portion of the Draft TMDL analysis and action plan." Public Comment! until 8/27/09 Ca. Regional Water Board action mandates regarding Draft Klamath River Total Maximum Daily Loads. This this is a draft mandate to improve naturally warm and mineral-laden water. Clean Water Act raises hackles, Capital Press 7/2/09. "The move brings the country one step closer to the largest federal land grab in our history, the National Cattlemen's Beef Association said." ***Immediate Action Alert: S. 787 Clean Water Restoration Act To Be Marked Up Thursday, June 18 @ 9:30 a.m. PLEASE write! KBC responds to Felice Pace article, Keno Reservoir and Interim Dam License Conditions – A Klamath Sleeper Issue, posted 3/29/08. Pace wants to downsize ag more and create more wetlands (there are already more than 100,000 acres of wetlands) or build a treatment plant, the same possibly proposed requirements as the Calif. water board. National Academy of Science Dr. William Lewis said this water was historically naturally saturated and laden with phosphorus. Also, 70 million tons of bird poop makes a lot of natural nitrogen, much being certified organic. March 27 - Comments due on draft Klamath River TMDL implementation plan in Calif. Lawsuit Aims to Protect Northern California Salmon Habitat, posted to KBC 3/20/09. Pacific Coast Federation of Fishermen, North Coast Environmental Center, Klamath Riverkeeper are among Klamath Basin Restoration Agreement stakeholders suing the Calif. Water Quality Control Board to regulate water quality in the Klamath Basin. The historically warm, mineral laden water must become clean. February 2009 lawsuit. Court petition HERE. The public comment period will close at 5:00 p.m. on March 27, 2009. Plan, Summary and Scoping, posted to KBC 2/25/09. " Klamath TMDL, by Siskiyou County Supervisor Marcia Armstrong 3/6/09. "...rather than attempt to clear algae from reservoirs, PacifiCorp/Power’s ratepayers may be asked to fund the establishment of wetlands in the upper basin to filter nutrients or perhaps fund a water treatment plant at a narrow point like the Klamath Straits Drain to treat the water or mechanically remove algae and organic matter before it comes down river." March 4, Tulelake, public meeting and comments regarding Water Quality regulations. *Response to Klamath Hydroelectric Project (FERC 2082), Water Quality Certification, request to extend the February 23, 2009 comment deadline. More info on comments needed. **Response to Klamath Hydroelectric Project (FERC 2082), Water Quality Certification, request to extend the February 23, 2009 comment deadline. VERY IMPORTANT!! March 27 - Comments due on draft Klamath River TMDL implementation plan in Calif.
Yreka - Residents sound off at dam meeting, Siskiyou Daily News, posted to KBC 10/29/08. IMPORTANT! KBC INFORMATION from Ca. Water Board - Send written comments regarding the Klamath Hydroelectric Project Environmental Impact Report to the address below. Identify a contact person in case the board has any questions about your comments. Comments must be received by 4 p.m. FEB 23, 2008. Agencies ordered to share documents with environmentalists, Capital Press, posted to KBC 2/27/09. Clean Water Act definitions of "Waters of the United States." Water quality comments submitted for Siskiyou County by our environmental consultants to the State of California Water Resources Control Board on the likely impacts of considering dam removal as a cure for water quality issues (algae, temperature) in the operation of the hydroelectrioc dams. Harvesting Klamath algae, H&N, posted to KBC 10/30/08, followed by, Why is there so much algae in the lake? Notice of preparation and of scoping meetings for an environmental impact report for 401 water quality certification of the Klamath hydroelectric project, posted 10/5/08. MEETING NOTICE - Ca State Waterboard explains the Environmental Impact Report for water quality certification, followed by public comment. posted 10/5/08 Important to attend! Judge rules on toxic algae regulations, H&N, posted 6/16/08. Don’t take away my fishing hole, H&N 4/1/08. "If algae in the Klamath River is a problem caused by the PacifiCorp dam system, then please explain the source of the algae blooms in Lake of the Woods, Fish Lake, Hyatt Lake, and all the other fishing sources in the area." Maps put basin's water, fertilizer in perspective, Geologic study changes thought on sources of irrigation, water quality, Capital Press, posted 3/29/08. "...new findings show phosphorous is naturally occurring in Upper Klamath Lake. Roseburg said phosphorous is a major element that contributes to algae blooms in the lake and the Klamath River. When the blooms die, the decomposition process uses oxygen in water, which can result in fish die-offs." From Senator Whitsett, posted 2/21/08. "...ranching and farming activities do not, and could not, cause these elevated phosphorous concentrations, and that steps to reduce fertilizer use or cattle grazing would have little or no impact on improving water quality in the Upper Klamath Basin." Attorney fears federal revision will engulf U.S. (with Clean Water Act); Proposed legislation broadens legal definition of waters of the U.S.’ Capital Press 12/7/07. WRITE! Comment period extended! Water law proposal alarms, Organization opposes bill that would redefine waters addressed, Capital Press 11/30/07. "If this passes, the federal government will have the authority to control all our water and activities affecting our water, thus pre-empting state and local government authority over land- and water-use decisions..."
Congress Should Oppose Expansion of the Definition of Waters of the United States, WAC 10/07. "It expands the regulatory authority of the U.S. Environmental Protection Agency (EPA) and the U.S. Army Corps of Engineers to include all “intrastate waters” – essentially all wet areas within a state including impoundments, groundwater, ditches, pipes, streets, gutters, and desert features." Please contact your Congressmen to oppose H.R. 2421/ S. 1870. HERE for information. North Coast Regional Water Quality Control Board Scott Shasta algae tour, Siskiyou County Supervisor Marcia Armstrong District 5, posted to KBC 9/28/07. "...the Karuk tribe, one of the complainants regarding algae, has been selected to do the collection and analysis of algae samples...They claim that algae has detrimental effects on salmonids as well as people. It is one of the arguments they use for removing the dams." No secrets, Pioneer Press, posted 8/2/07. Water quality control board had secret tour/meeting with Karuk Tribe, Klamath Forest Alliance subgroup Riverkeeper, and kicked out the press. * Water Quality meeting, Yreka 7/25, "Several local residents are encouraging fellow Siskiyou County residents to attend the meeting to discuss one proposed resolution in particular, authored by Klamath River Basin resident Felice Pace." Important Water Quality Control Board Meeting in Yreka!, by Marcia Armstrong, Siskiyou Co. Supervisor, posted 7/19/07, followed by news on Detrimental Mining Bill. "There have been several unsuccessful lawsuits by the Karuk tribe and others to halt suction dredge mining in the Klamath River and its tributaries..AB 1032 was introduced to change the law legislatively and shift the burden of environmental impact analysis onto the backs of individual miners." The Clean Water Act positioned to create environmental disasters, by Bill Kennedy, Klamath & Glen County rancher 6/29/07. "The use of the TMDL process and implementation of water quality management plans has potential to shut down our western economies." Capital Press 6/29/07. "Luther Horsley, president of Klamath Water Users Association, said the standards seem unachievable given the historical natural conditions of the huge nutrient load while irrigation has improved water quality in some areas. “Are we trying to make the water quality better than it was historically?" 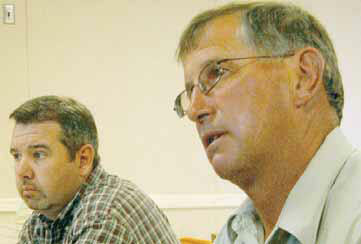 Klamath Water Users Association President Luther Horsley, right, and KWUA Executive Director Greg Addington were among those in the audience who expressed concerns over the EPA’s Lost River water quality regulations for Klamath Project irrigators. A helping or harming hand, H&N 6/27/07. Clean Water Restoration Act of 2007 Will Trump State Authority, NWRA, 5/23/07. Rapanos VS U.S. 6/19/06 pdf. Joe Raeder, the Family Farm Alliance’s DC rep, sent the following earlier this a.m. "A divided Supreme Court ruled this morning that Clean Water Act protection of "waters of the United States" is limited to "permanent, standing or continuously flowing" water. The ruling limits protection for wetlands separated from "navigable waters" or their tributaries. Justice Anthony M. Kennedy cast the swing vote in the 5-4 ruling in the joint case, Rapanos v. United States and Carabell v. U.S. Army Corps of Engineers." TV show misses many real Klamath River issues, H&N 4/4/07. "Even reports from the first explorers said that water quality in late summer on the Link River was poor, at best. I’ve heard it said that it was so bad the horses wouldn’t drink it. That may or may not be true, but such a very large body of water that is as shallow as Upper Klamath and Agency lakes could never be crystal clear. If that isn’t enough to cloud the issue, there were 15 million waterfowl feeding and defecating in the water. Today, the number of birds is less, but still a significant contributor to algae growth." Water issues on local lawmakers agenda, H&N 3/20/07. "State Sen. Doug Whitsett, R-Klamath Falls, continues to work on water issues affecting the Klamath Basin. The senator recently met with Gov. Ted Kulongoski’s natural resources policy director to discuss the total maximum daily load on Upper Klamath Lake. Whitsett wants to address inaccuracies in the load. Whitsett also is campaigning against HB 2564, which would require water measurement devices on all domestic and agricultural wells, irrigation allocations and pond and stream diversions." Clean Water Act issue, OFS 3/2/07. "Therefore, ditches, pipes, man-made ponds, ephemeral drainages, desert washes, wet-farmland, drain tiles, treatment ponds and other features could be regulated as “intrastate waters” even though they're not on the list." How the Klamath's polluted, by Jim McCarthy, ONRC in Sacramento Bee , posted 9/16/06, with KBC commentary. Water Conditions During Upper Klamath Lake Fish Tracking Study Analyzed, DOI and USGS Report, pdf file, posted 9/14/06. Press Release HERE. An Assessment of the Effects of Agriculture on Water Quality in the Tulelake Region of California, 1995, pdf file, by S.R. Kaffka T.X. Lu and Dr. Harry L. Carlson, University of California Intermountain and Research Extension Center. Another view: Water use on Klamath not so simple by Greg Addington -- Special to The Sacramento Bee, published 8/27/06 "The Bee Editorial attempts to connect Klamath Project agriculture to the toxic algae blooms behind hydroelectric reservoirs on the Klamath River. It alleges that “In the Klamath, fertilizers from farms on the Oregon-California border flow downstream”. The Bee is making claims that it can not substantiate." Geese blamed for Lake Tahoe pollution, SF Gate, posted to KBC 6/17/06. "A 10-pound Canada goose can produce four pounds of nitrate- and phosphate-rich feces every day..." (KBC comment: In the Klamath Basin, more than 100,000 acres of ag land has been converted to wetlands for birds by government agency and Nature Conservancy acquisitions. This evaporates twice the amount of water used by ag land, and worsens the water quality. Good news -- Judge Coughenour has endorsed the stipulation removing the Oregon Coastal Coho from the Washington Toxics injunctive order that imposed buffers for use of certain pesticides near coho streams in this ESU. A copy of the signed order is attached, Terry and Paulette, Oregonians for Food and Shelter. pdf file of Wa Toxics Coalition, plaintiffs, vs EPA and Croplife America. To amend the Federal Water Pollution Control Act to clarify certain activities the conduct of which does not require a permit, OFS 3/6/06. California Regional Water Quality Control Board. Pollution rules confuse Calif. farmers, SeattlePI, 4/28/04. State has new water standards to protect fish, Salem Statesman Journal, 3/3/04, "The change: The state now has online maps of Oregon waterways with descriptions of the optimal temperature for the survival of salmon and trout species for each tributary and time of year. The old standards used an all-encompassing 64 degrees for the endangered fish."